I have a cubicle-bound job. You probably know that that means I sit at my desk all day looking at my computer. When there’s no more internet to check and it’s ages until the next milestone of the day, it’s very easy to eat out of a sense of boredom. Once, I printed up a flowchart that I’d seen around the internets: “Are you hungry, or are you bored?” Have a glass of water, and then reevaluate, it suggested. Even well-intentioned notes to myself fail when my first step is doing what’s convenient rather than what’s better for me. The company I work for stopped supplying disposable cups, and instead of bringing my own cup, I got in the habit of drinking multiple diet sodas instead of water, often going to the gas station to buy bottled drinks – and while I was there, I’d get some gum, chips, and even candy. Earlier this week, I once again started tracking my food at Livestrong.com (it’s not very interesting, but here’s my profile). As always, accountability makes me much, much more careful about what I eat. I ate a little over my daily goal on several days and drowned myself in food on Friday, which is a common end of the week occurrence. But I managed to pick up some healthier snacks and discover a few things that will keep my morning routine on track, keep me from visiting the gas station as often, and keep me satiated. Food packed for work on Thursday. I picked up a container of Boost meal replacement drink and have been preparing that in a mason jar with plain water for breakfast in the mornings for a 150-calorie meal. I drink it on the way to work, then rinse out the jar when I get to the office and use it for my water cup. 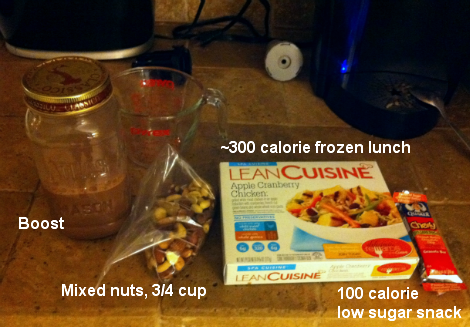 This mix is chocolate, so it satisfies my morning sweet craving, and it has some protein. It doesn’t keep me satisfied for terribly long, though, and I wind up with a growling stomach by 11, so I eat one of my two snacks, the granola bar or some nuts. I packed 3/4 cup that day, but I wound up only eating half of it. I’ve tried doubling the amount of Boost I drink in the mornings to see if it satisfies me longer without a need for another snack, and that didn’t work out very well. Altogether, this is about 800 calories that I eat during the day, leaving me 600 calories for the rest of the day – whatever we’re having for dinner, my beloved morning coffee, and occasionally, smaller snacks like Blow-Pops. It’s not a perfect setup, and I’ve only been structuring my daily eating habits like this for a week. Hopefully, I will be able to stick to it. Another habit I hope to keep is eating fruit. I bought berries, grapes, and apples this week, and I’ve been eating fresh fruit every day as an evening snack. I found myself getting a little excited about the different kinds of apples when helping my boyfriend pick out a couple to use in a pork roast he made in the crock pot earlier this week. Yeah, I know, I’m a dork. I realize counting calories doesn’t work for everyone and may be harmful for some people. It is, for better or worse, the method that works the best for me. Only by being accountable do I seem to be able to lose any weight or even keep any kind of control on my eating. I know myself – I need structure, and having structure helps me to be disciplined. Knowing exactly what I’m allowed to eat and having it on hand eliminates worry at the gas station, makes the decision to eat what I brought for lunch that much easier, etc. It helps me relax and makes me more apt to stick with a program. And it helps that I’m not dropping $6 on snacks at the gas station every day for a week; it really adds up. I’d rather spend it all at once at the grocery store in bulk so I’m not paying the premium for convenience store servings. This entry was posted in food and tagged food, habit. Bookmark the permalink.